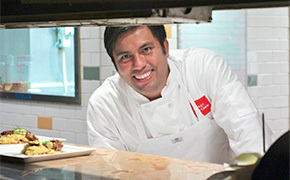 Chef Ricardo Zarate vaulted onto the local food scene in 2009 with his hole in the wall Peruvian spot, Mo-Chica, located in the off-the-beaten path Mercado La Paloma near USC. His inventive fare at wallet-friendly prices soon attracted national notice. Restaurateur Stephane Bombet soon discovered Chef Zarate for himself and a business partnership bloomed. Their first venture was the upscale small plates establishment, Picca (just East of Century City,) which features Peruvian-Japanese small plates meant to share. From there Mo-Chica was relocated to expanded, and more fashionable, quarters in Downtown Los Angeles.